Try any of the following Cold Pasta Salad Recipes, or just invent your own cold pasta salads. For a broad assortment of America's favorite recipes, visit any of the links shown on this page. Or scroll down for another one of America's favorite cold pasta salad recipes. Heat salted water to boiling in a large covered saucepan. Add orzo and cook as directed on label. Meanwhile, in 12-inch skillet, heat oil on medium until hot. Add grape tomatoes and cook for about 5 minutes, shaking pan occasionally. Grate 1 teaspoon lemon peel and squeeze out 1 tablespoon of the juice; set aside. Reserve 1/4 cup orzo cooking water; drain orzo. Add orzo and cooking water to tomatoes in skillet. 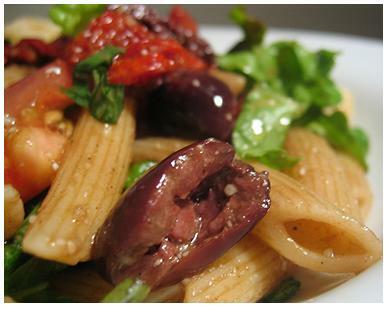 Stir in lemon peel with lemon juice, feta, olives, mint, and 1/4 teaspoon black pepper. Affordable Travel Deals to and from All 50 States. Factory Outlet Malls all over America.